Researchers from Kiel University together with colleagues from the USA and Brazil investigated the climate behavior nine to five million years ago, when polar ice was reduced and the subtropical belt expanded. For this study, they analysed geochemical signals in microfossil shells from an exceptionally well-preserved seafloor sediment core recovered from the South China Sea. Researchers from Kiel University together with colleagues from the USA and Brazil investigated the climate behavior nine to five million years ago, when polar ice was reduced and the subtropical belt expanded. For this study, they analysed geochemical signals in microfossil shells from an exceptionally well-preserved seafloor sediment core recovered from the South China Sea. They found that a climate cooling trend between seven and five and a half million years ago was accompanied by the intensification of the East Asian Winter Monsoon, leading to increased biological activity in the ocean, and a reduction in atmospheric greenhouse gases. The study is published in the current issue of Nature Communications. “The analysis of this exceptional sediment core allowed us to reconstruct in high temporal resolution the climate history of the last 16 million years in an area sensitive to monsoonal climate variability”, says the first author Dr. Ann Holbourn from the Marine Micropaleontology Working Group at the Institute of Geosciences, Kiel University. The 607 m long sediment core, which yielded extraordinarily well-preserved carbonate shells of marine microfossils such as foraminifers, was recovered by the deep sea drilling vessel “JOIDES Resolution” of the International Ocean Discovery Program (IODP) in 2092 m water depth in a part of the South China Sea that is strongly affected by the East Asian Monsoon. “Our findings imply that even small changes in CO2, amplified by positive feedback loops, can have an impact as dramatic as changes in Antarctic ice cover and lead to drastic changes in global climate”, comments Professor Wolfgang Kuhnt, leader of the Marine Micropaleontology team at Kiel University and co-author of the study. “This research will help to unravel the complex climate system of our planet and to predict how the future climate of the Earth may develop”. The period between nine and five million years before present, the late Miocene has seen some of the main steps of global climate evolution into the modern world of glaciated poles and relatively narrow tropical and subtropical belts. The period was overall still warmer, high latitude glaciation less pronounced and tropical/subtropical belts wider similar to the climate we expect in the near future. A better knowledge of climate dynamics in a warmer world with atmospheric pCO2 concentrations similar to today will help to predict future climate trends. The new study reveals an important component of climate change in a little investigated warmer period of Earth’s history. For the reconstruction of the past climate conditions the scientists had to rely on indirect information. They analysed in the laboratories of the Institute of Geosciences and Leibniz-Labor for Isotope-Research, Kiel University carbonate shells of foraminifers, small marine organisms that live near the sea surface and at the seafloor. These tiny organisms take a chemical snapshot of the surrounding water and store this information in their carbonate shells, before they are buried at the ocean floor. Over a long period of time, these shells build thick sediment successions as an archive of changing ocean and climate conditions. Ann E. Holbourn, Wolfgang Kuhnt, Steven C. Clemens, Karlos G. D. Kochhann, Janika Jöhnck, Julia Lübbers, Nils Andersen, Late Miocene climate cooling and intensification of southeast Asian winter monsoon, Nature Communications, Volume 9, Article number: 1584 (2018), doi:10.1038/s41467-018-03950-1. 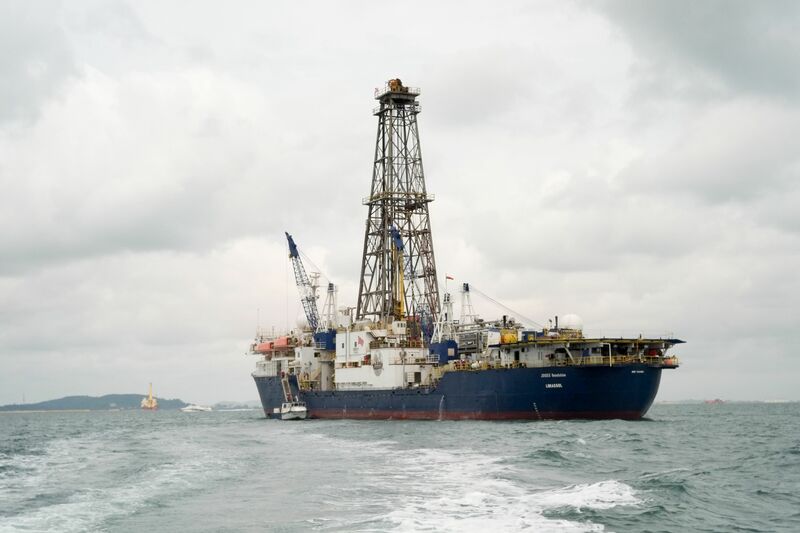 Caption: The 143-meter-long scientific drillship JOIDES Resolution is one of the few research vessels used worldwide that can extract long sediment cores from great depths. 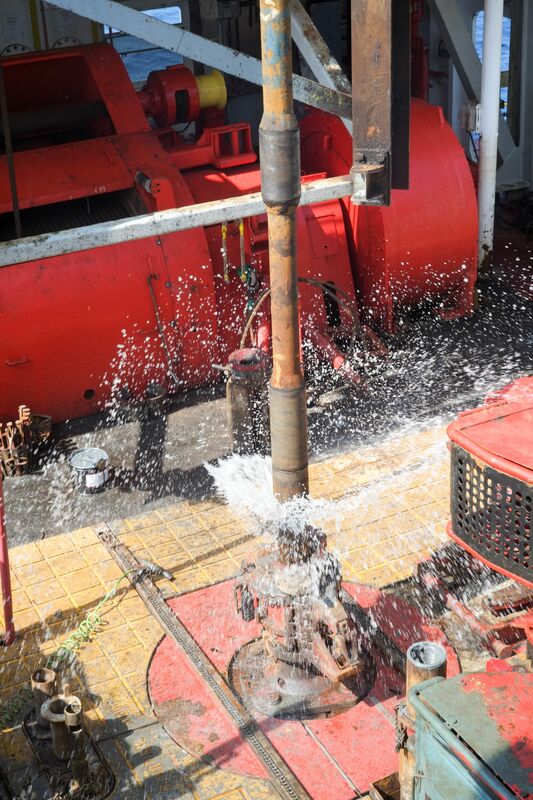 Caption: With a special drill pipe designed to work in great depths, the several hundred meter long sediment cores are brought in 10 m segments to the deck of the research vessel JOIDES Resolution.